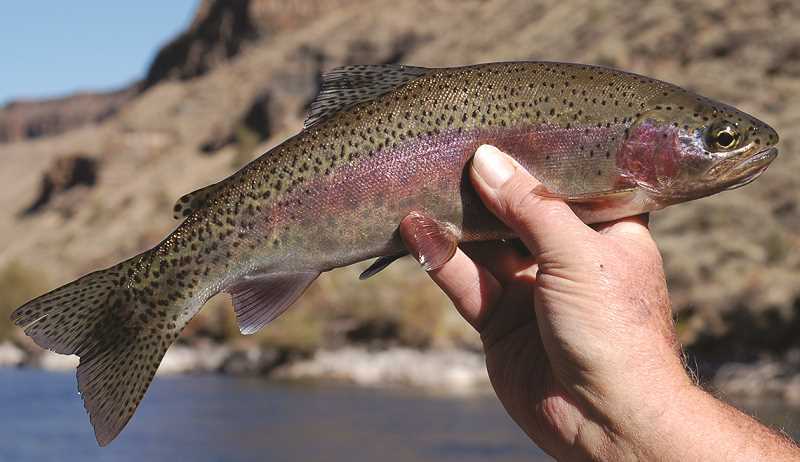 Redband trout populations in the Crooked River have dramatically improved since a study two years ago discovered they had dwindled to a record low. A study conducted by Oregon Fish and Wildlife in October 2016 found that the density of fish had dipped to 350 trout per mile, an 87 percent reduction from the 2015 estimate. "Releases from Bowman Dam have resulted in the natural flow regime being reversed from high flows in late winter and low flows in summer and early fall, to high flows in the summer (irrigation releases) and low flows in the winter (to refill the upstream reservoir)," the report stated. This year, ODFW has yet to finish compiling data, but Assistant District Fish Biologist Tim Porter estimates the river now has about 3,500 fish per mile that are at least 8 inches long. "With better water, especially during the winter, we have been seeing an increase in the population," Porter said. Whether or not the fish population will remain or increase is difficult to know. Porter said that the winter flows are the primary factor, and in the winter of 2015-16, they had dropped to about 35 cubic feet per second. Compounding the issue, the area experienced a severe cold snap, and the fish had nowhere to go to escape it. "They didn't have the deeper pools that they needed," he remarked. "You need to have the habitat available for the fish." Porter said a working group of agencies help determine how much water will be released into the river from Prineville Reservoir during the winter. The Bureau of Reclamation ultimately makes that decision, but they are in consultation with both the U.S. Fish and Wildlife Service and the National Marine Fishery Society. "Our agency has been involved as well," he said. The plan, Porter has heard, is to try to keep the winter flows around 65 cubic feet per second. Another way to potentially keep fish populations robust is to make modifications to Bowman Dam that reduce the likelihood of gas bubble disease. According to the 2016 ODFW report, during high discharge from the dam, "nitrogen becomes entrained in water to levels that are deleterious to fish through a condition known as gas bubble disease." Gas bubble disease, the report explains, involves the formation of bubbles within the tissues of an organism that results in visible external signs or internal bubbles that result in tissue damage or mortality when the bubbles form emboli and block the flow of blood. "Even though modifications were completed on the outlet structure of Bowman Dam in 2006, gas bubble disease remains a problem in the Crooked River," the report states. "Making changes to the current discharge regime and outlet structure of the dam will benefit fish populations in the Crooked River. This will improve the likelihood of successful steelhead and Chinook salmon reintroduction and maintain a healthy and abundant redband trout population." As part of an effort to build a hydroelectric power plant on Bowman Dam, City of Prineville leaders are working to develop a report that shows the plant will diminish the likelihood of gas bubble disease. But until such changes are made, the winter flows remain the deciding factor on fish habitat, and if they remain optimal for redband trout habitat, Porter believes it spells good news for people who enjoy fishing the Crooked River. "That will make anglers happy, starting to see more fish in the 14-inch range," he said. "As conditions are good, we should see a more stable fish population and a better distribution of size classes."